Wow! What a coupon if you can get it. 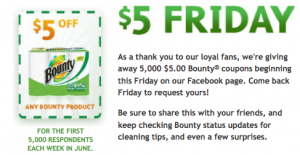 Starting this Friday, 6/3, Bounty will be giving away 5,000 $5.00 Bounty Coupons good on any Bounty Product. 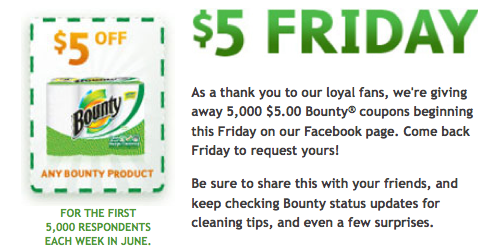 You can head over to the Bounty Facebook Page, “like” them and set up a reminder so you don’t miss it. Today’s Daily Deals – The Juno Company, Mabel’s Labels, ShoeCrush.com & More!